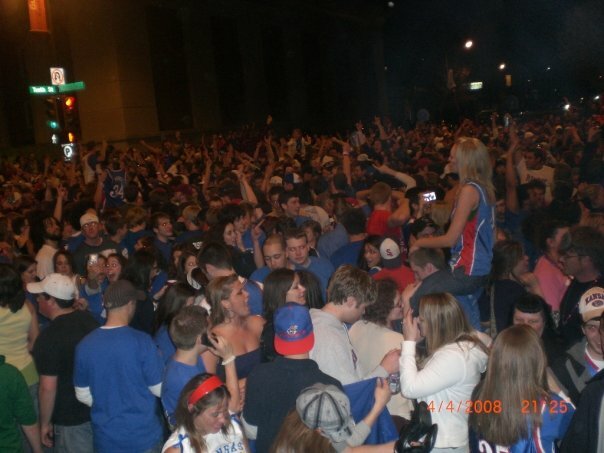 Damn these Kansas Jayhawks for having so much fun! I’ve been getting progressively stupider (on account of increasing levels of inebriation and brainwashed college spirit) phone calls, Facebook messages and texts from my sister who goes to Kansas and has been fortunate enough to see KU to go to the NCAA finals in her senior year. If you don’t remember anymore what it was like to be in college – broke as a joke and happy as could be – check this crazy picture that my sis just posted to Facebook. Damn these kids! Yammer, what are you good for (for my workplace)?